Hinky Dinky News Vol. 22, No. 1: January-February, 1966 – Hinky Dinky Parlay Voo? 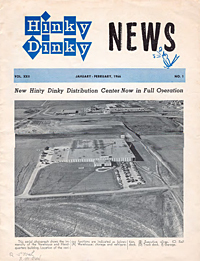 I’ve begun the process of scanning a collection of vintage Hinky Dinky News publications for inclusion on this site. There are a couple of dozen in my possession (courtesy of Uncle Bob). I’m going to try to plow throught he scanning over the next couple of weeks and begin adding them to the site at the rate of a couple per week. If you have some more of these in your posession or any other documents you think would make a good addition to the site, please let me know. I hope you’ll enjoy looking at these.